I don’t even know where to begin this post. I suppose it’s best to start from the beginning! One fine day last August I opened my email and my eye balls nearly fell off my eye sockets. I read the email in complete disbelief. I stared at it while batting my eyes. Then I got up, went straight to the kitchen and washed the pile of dishes in my sink. Just in case you are wondering, washing dishes doesn’t bring me any type of comfort, as a matter of fact I absolutely HATE washing dishes. But I needed something to distract me while I processed the email that I had just received. The email was from the managing editor of Saveur Magazine. She was scheduled to visit LA in late August to do research for a special issue about Los Angeles. 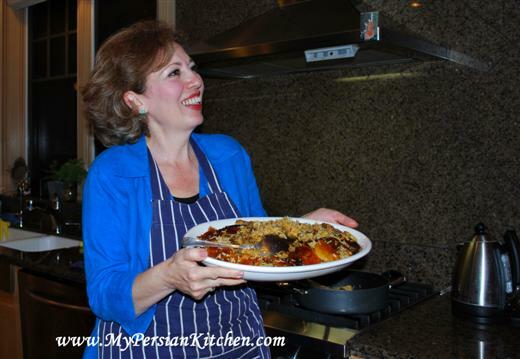 She needed someone knowledgeable about all things related to Persian food to show her around but also to connect her with a few well seasoned Persian cooks. I can honestly say that “Saveur Magazine Day” was one of the most memorable and fun days of my whole entire life. It was an incredibly hot day in late August right in the middle of a heat wave that we were experiencing and to make matters even worst fires were roaring through the San Gabriel Mountains as well as in the close by Palos Verdes Peninsula. Our day began at 10am in Hollywood where we first visited the famous Persian ice cream shop Mashti Malone. We then proceeded to go to Westwood, known as Little Tehran, where we had lunch at Shaherzad Restaurant. After lunch we visited two of my favorite markets in Westwood, Super Tochal and Jordan Market. We the went to the shopping experience/battle royale called Elat Market. For those of you that live and frequent Elat Market, I am sure you will agree with me that going to this market is an adventurous experience! Our next stop was Mrs. Noura Samimi’s house who was the first person to respond to my email seeking out experienced Iranian home cooks to be interviewed by the magazine. When we arrived to her home we were greeted with a divine glass of her own homemade Sekanjebin with grated cucumbers and mint. To say that it was the best drink to quench your thirst one a hot summer day is an understatement. We spent the next few hours watching Mrs. Samimi make a delicious feast centered around Lubia Polow. She went all out making Mast-o-khiar, Borani Bademjan, Salad Shirazi, Kuku Kadoo, and no Persian table is complete without a nice platter of Sabzi and some Torshi, Persian vegetable pickles. A couple of weeks later I was still basking in the whole “Saveur Magazine Day” excitement when I received yet another email from the managing editor. This time she wanted to know if I was interested in writing the article that was going to be included in the issue about Persian food. Can you guess what I did as soon as I read that email? Yap, I got up and went to tackle the piles of dishes in my sink from my cooking session. I may have also done a chicken dance on my way to the kitchen while tears of excitement may have possibly streamed down my faced. Can I just remind everyone that all I wanted to be was an English instructor and that I started this blog because I was unemployed? Who would have ever known that I would get to the point where when you search for Persian food blog I am the one that comes up? Not me!!! Fast forward a few months. Well that issue is now on the stands. I received a couple of copies of it in the mail yesterday! You can also see their website by clicking here. 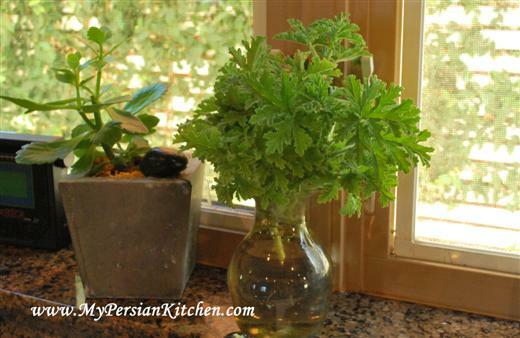 And the “windowsill geranium?” Here it is! I can’t begin to tell you how much I fell in love with Mrs. Samimi. She was so generous with her time and cooked a fabulous meal with three curious, inquisitive, and hungry intruders in her kitchen, two of which (one being me!) took pictures, while the other took notes! We honestly did help doing some chopping and what not, but really she was the super star! 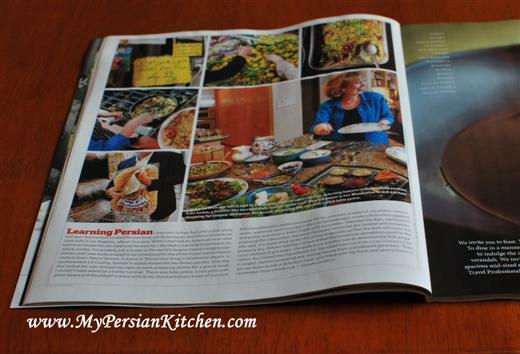 I am thankful to Saveur Magazine for having taken the time to familiarize themselves with Persian Cuisine and provide a forum to share our food. It is very important for me, and for the Iranian community, to be given the opportunity to showcase our delicious and rich food, but most importantly display a positive aspect of our culture which is seldom seen in the media. I can’t conclude this post without acknowledging my appreciation and gratitude for YOU the readers. While this blog has given me a place to share my love for writing and cooking, the opportunity to keep it going and alive is thanks to all of the readers who stop by here every day, week, and month. Your continued support and encouragements keep me going and energized. Woohoo! I’m sooooo proud of you! This is so thrilling! I’m going to see if I can grab a copy when I’m off the mountain next time. Bravooooo! This is so cool. I’m buying a copy of the magazine tomorrow morning. I can’t wait to read the article. Congratulations. A job well done! Congratulation, even though they cut a a lot of your original writing, it was great and one could feel your compassion and with your great pictures I could almost smell the delicious food! As for your host and hostess, ironically we are having a family reunion tonight with Samimi’s and what better way to celebrate than showing and sharing your blog tonight with the family. Thanks Shohreh Jan! Have a lovely time tonight!! Hi, First of all let me congratulate you on this huge accomplishment. 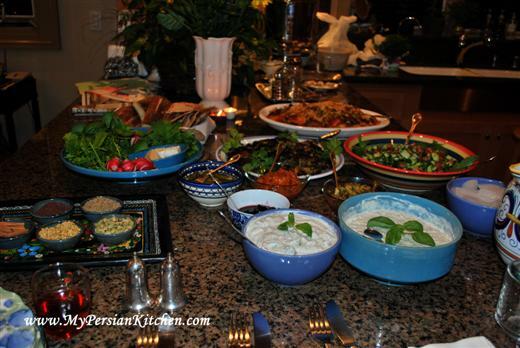 I just recently came across your Facebook site and ever since have been enjoying your recipes, tips and ideas about persian cooking. Us (Persians) definitely needed a site like yours, specially for us, the younger generations who have trouble reading Farsi persian cook books and classics such as Rosa Monatazami. Somehow your site reminds me of the Julie & Julia project, and I hope soon it continues to receive the same praise and attention it very well deserves. I live in Abu Dhabi, so I keep an eye on next month’s Saveur magazine:) Keep up the great work, looking forward to more recipes:) p.s- I’m so glad you posted Martha’s Duck Confit recipe, I think it would be a beautiful addition to Norouz lunch/Dinner. Congratulation to you. I was not surprised at all. You are very capable and talented , definitely deserved to be recognized .I am very happy for you. I feel very proud that our young generation like your-self are trying hard to keep our culture alive, in spite of what is going on,it felt great seeing your article. I am very proud of you. By the way I love your blog. This is an amazing accomplishment. I’m so proud of you. Bridette, Nasrin, and Negar jan, thank you for your kind words! You’ve worked hard for this opportunity and you deserved it. I’m thrilled that you got this exposure. So, what’s next? OMG. I am sooooooooo happy for you. I just stumbled upon your blog recently and must say it’s definitely one of my favorite food blogs. Congratulations on this HUGE accomplishment. @ Roia, thank you so much! The plan is to keep on posting!!! @ Kimiyo, thank you for your kinds words! I am glad you enjoy my recipes! @ ap269, thanks so much for your support. You will be happy to know that I am posting the eggplant ice cream recipe on monday!!!! Wow!!! I am SO happy to hear about this! You are amazing and definitely deserve it all! I don’t get Saveur magazine but plan on picking it up just to read your article! Congratulations!! I hope you have many more such opportunities to come! An Indian cook in NY, thank you!!!! Whoah. This is kinda awesome. Congrats! What an honor! I just got my issue 2 days ago, haven’t worked through it yet. Hooray, this is HUGE! Way to go, my friend! I will grab a copy of Saveur ASAP. Can’t wait to read the article and drink in the photos and recipes. So proud of you. Great job done. Congratulations! !I enjoyed this email so much. Wishing you the best. Congratulations. This recognition is fantastic and well deserved. Congratulations! How exciting! The Persian wife and I and my half-Persian kids may be coming out to LA for Noruz. They live in Westwood so I’m guessing I might get to visit some of the same restaurants. Interesting she started with Lubia Polow. I made Khorest-e-Lubia last week for the first time from our Persian Cookbook. Turned out well! The recognition is definitely well deserved. You have a great blog here! Moe, thank you! Norouz is a great time to visit Little Tehran! Make sure you have Jordan Market’s pirashki!! *to visit her relatives (who live in Westwood). Previous comment was not very clear! I have never heard of pirashki, but I will definitely try it if I am out there! I picked up Saveur and have been very inspired by your blog. I’m a pretty good young persian cook but every now and again I want to make something that I just cant find the recipe for, and so I turn to you. Unless I call the aunts in San Diego! What is brilliant about your site is the step by step visuals b/c really, Persian food is so time consuming and so much about technique that unless you grew up watching your mom or grandma making it, it’s hard to just follow a recipe. This is where your photos come in. Congratulations on a blog that appeals to us modern iranians that are a little bit western, but a whole lot vatan parast! Afarin, khanum jan, Sad Afarin ! @ Marjan, thank you for your kind words and for your support. You made my night! I am created the design of the blog based on my own appreciation for blogs that have the same format. I have to say it is a lot of work, but it is well worth it! I love your reference about “us modern Iranians that are a bit western, but a whole lot vatan parast!” It’s very very true! @ Vivi khanoom, thank you thank you thank you!!! Thank you all for your kind words, they means so much to me. This was a very exciting thing and I glad I could share it with you all!